“Floors, walls, ceilings, and doors and windows all combine to make up the “energy envelope” of your home. Weatherstripping seals around doors and windows to help make your home airtight. Weatherstripping is probably the least expensive, simplest, most effective way to cut down on wasted energy in the winter and summer. Improperly sealed homes can squander 10 to 15 percent of the homeowner’s heating dollars and reduce the effectiveness of air-conditioning in the summer. 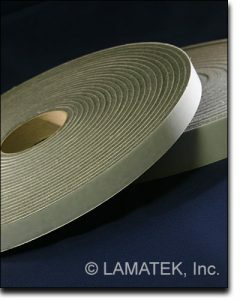 LAMATEK provides foam weatherstripping tape with adhesive backing. It takes almost no time to install and requires no tools (except scissors or a utility knife). Simply cut to proper length, peel off the paper backing and stick in place. Nothing could be simpler. Foam weathersealing tapes are provided in rolls of tape on a 3″ core tube or in large volume spools for longer run applications. LAMATEK also provides custom cut strips and adhesive backed pieces on a roll for quick pick production line processes. PVC Foams provide a longer term, durable seal through their ability to recover from compression over a longer span of time. Their inherent fire retardency and UV (ultra-violet light) resistance makes them a natural choice for sealing leaks around external windows and doors. PVC tapes are also available in either black or light grey making them easier to blend in with your decor. Rubber Sponge provides an excellent seal with good durability. Neoprene rubber and EPDM is available in black only. Like PVC, rubber weathersealing provides a good seal against outside elements including moisture. Rubber sponge is best suited for sealing applications that do not require compression recovery from repetitive resealing (like the opening and closing of windows and doors). Polyurethane foams like Ether and Ester provide good insulating properties at a very low cost. They are not as resistant to environmental conditions and are better suited for indoor weatherstripping where direct exposure to moisture or UV light is limited. Urethane foams provide superior insulation properties, with R values similar to fiberglass insulation, and serve as an excellent light barrier.